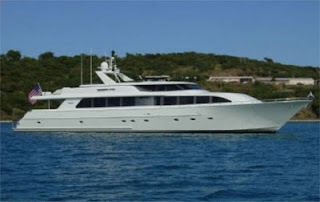 Luxury Yacht Milk Money now available for charter after interior refit. Master Stateroom: Amidship: California King-sized bed, Walk –in cedar-lined closets., full dresser, Lighted vanity make-up mirror, Custom Settee between cabinets. Private his & her heads with marble flooring and countertops, Kholer Whirlpool tub & Marble tile shower. Entertainment center with 32” Flat screen TV, DVD & iPod dock. VIP Stateroom: Forward: Queen-sized bed with ample storage, cedar lined closet. 27” flat screen TV with DVD & iPod docking station. Ensuite head with shower, marble countertop and flooring. Guest Stateroom: Port: Queen-sized bed with ample storage, cedar lined closets. 21” flat screen TV with DVD & iPod docking station. Ensuite head with shower & vanity with marble countertop. Guest Stateroom: Starboard: Twin berths, cedar lined closet. 21” flat screen TV with DVD & iPod docking station. Ensuite head with shower & vanity with marble countertop. Salon/Main Deck: Custom built in sofa with end table, occasional chair, Entertainment center with 36” drop down TV, home hteater system, CD, DVD and iPod docking station. The full bar in the salon includes a sunken floor, built-in icemaker, and 4 chairs. Moving forward is the circular dining table with seating for 8. Aft Deck: Varnished table seats 8 on molded in settee and 2 separate teak chairs, and full wet-bar. 27” Flat Screen TV. Child-proof stainless safty gates to contain smaill children on Aft Deck. Spiral staircase to flybridge. Stairs leading to the swim platform which has a hand-held shower with hot and cold water. Flybridge Deck: Bar with 5 bar stools, wet bar with sink, icemaker, refrigerator and Jenn-Aire grill. Comfortable sized seating area with 2 hi-lo tables.Child-proof stainless safety gate to contain small children forward of hot-tub. Whirlpool Jacuzzi with sun pads. AM/FM receiver w/CD player and iPod docking station.